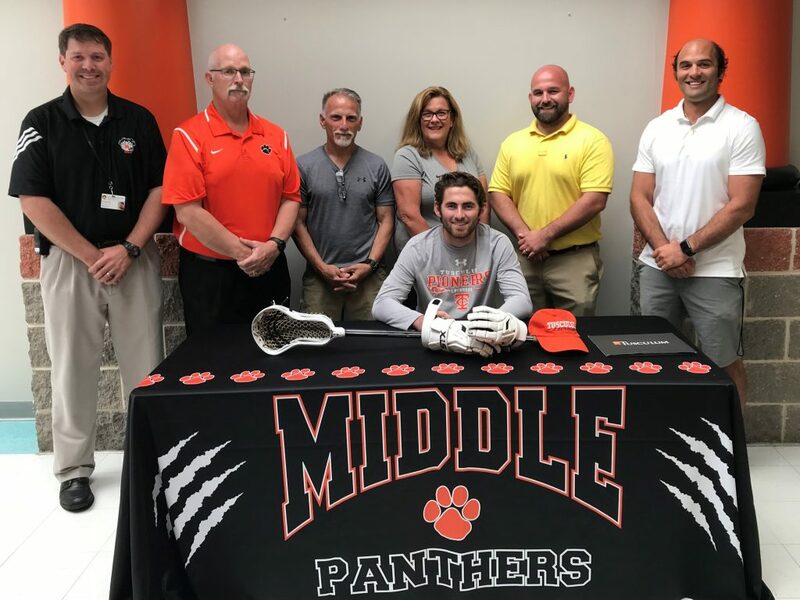 Middle Township High School senior Giovanni Berardis (seated) has signed a National Letter of Intent to play college lacrosse at Division II Tusculum College (Tenn.). He is joined by (from left) Middle Township principal George West; Middle boys lacrosse coach Tom Griffin; his parents, Nick and Georgeann; his brother, Brian Hindle; and Middle wrestling coach Matt Wolf. Middle Township High School senior lacrosse player Giovanni Berardis made his college choice official on Friday. Berardis officially signed to play college lacrosse at Division II Tusculum College in Greenville, Tenn.
Berardis was joined at the signing ceremony by his family, coaches and school administrators. Playing for a rebuilding Middle team decimated by injuries this spring, Berardis still managed to score 27 goals and pass out four assists as a senior. He also recorded 22 ground-ball pickups. He finished his career with 83 goals and 29 assists for 112 points. Berardis was also a standout wrestler at Middle, going 27-13 as a senior while competing at 170 or 182 pounds. Tusculum College’s men’s lacrosse team is a member of the South Atlantic Conference. The Pioneers went 4-9 in 2018.